Description: Alkanes treated with chlorine gas (Cl2) and light (hv) or heat will be converted into alkyl chlorides. Notes: If this occurs at a stereocenter, a mixture of alkyl chlorides will be obtained. 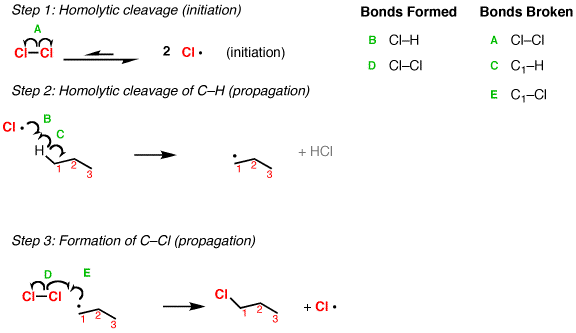 Also note that one equivalent of HCl is generated for every C–Cl bond that is formed. Chlorine is not particularly selective, so the mixture of products will reflect statistics. 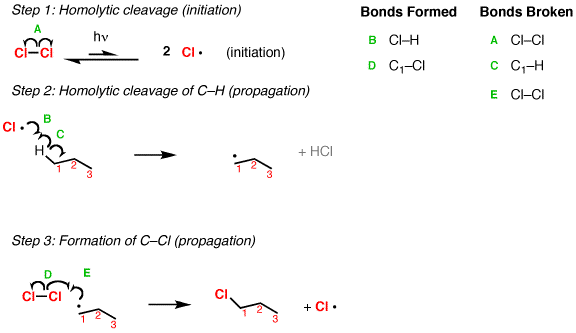 For example in the third example (propane) there are six C–H bonds on the methyl groups, and two C–H bonds on the CH2 group, so the product mixture will be 3:1 favoring 1-chloropropane over 2-chloropropane. 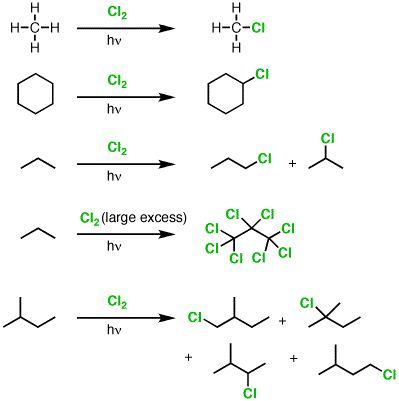 Mechanism: When treated with light, Cl2 fragments to chlorine radicals (Step 1, arrow A). At any given time only a small amount of these radicals are present. There’s lots of leftover Cl2! Remember that, as it comes up in Step 3. Chlorine radical then abstracts a hydrogen from the alkane, leaving behind the alkyl radical (Step 2, arrows B and C). The alkyl radical then reacts with Cl2, giving the alkyl chloride (Step 3, arrows D and E) and a chlorine radical, which can be recycled to perform Step 2 with another equivalent of the alkane. Notes: A common mistake is to show the carbon combining with Cl• in the second step! That’s not a propagation step, that’s termination! I enjoyed the preacher voice and thought it was hilarious. An entire video in this voice would be funny, if you can sustain it. The real, absolute treasure of this and all of your videos, is the iron-clad stamina you grind out in carefully explaining each step for us. This commitment to clarity and simplicity is a driving sense of beauty so many of us appreciate but are just too busy to stop and thank you. Chris is right. Thank you for the passion in your teaching! It rubs off onto the students . . . Thanks for the videos. Very helpful. In the second example you start with propane. The description of the mix of products that results refers to butane. Not a big deal though. The image in the first example is unrelated to this reaction. The relative rate of chlorination products is not only related to the number of primary, secondary, and tertiary hydrogens on each carbon, but also the tendency of radical formation at primary, secondary, and tertiary carbons. Relative rates of chlorination -> 5 at tertiary, 3.8 at secondary, 1 at primary. I just pulled those from memory, someone double check. Bromination is significantly more selective towards tertiary carbons. This is over simplified in your explanation. Thank you for adding this comment, you are correct that there are different selectivities of different types of C-H bonds. Odd series of questions, but what would happen to other functional groups if I did this reaction? For instance, if I have but-2-ene or -yne and threw in Cl2 and light, would the Cls simply do chlorination of the alkene/yne? If I have a Carboxylic acid attached to a 3-carbon chain, would this result in the alpha hydrogen being replaced with a Cl? Where is the example? Sorry, I do not see it as one of those. Did you mean Propane? Thanks for pointing this out – fixed. It refers to propane.